Staring out into the rows of students at a Harvard Kennedy School lecture, a professor asked, “Are there any questions?” Among the group of pre-professionals and twenty-somethings pursuing their degrees, a three-year-old raised his hand. That toddler was the youngest child of Anna Escobedo Cabral, a 1990 graduate of the HKS Master in Public Administration program. This situation was not an uncommon occurrence for Cabral, who attended the Kennedy School while caring for four young children. “Because I was living on a limited income, a very tight income, they would come to school with me sometimes,” Cabral said. Cabral has come a long way since her days of bringing her children to class. Her devotion to public service led to her nomination by President George W. Bush as the 42nd Treasurer of the United States in 2004, filling the vacancy left after Rosario Marin’s resignation to serve as the highest-ranking Latina in the Bush Administration. Growing up in California, Cabral, the eldest of five children, came from a family of modest financial means. Neither of Cabral’s parents finished high school, and Cabral said that her parents’ goal for her and her siblings was to graduate high school. Intent on finding a full-time job in order to support her family, at the age of 16, Cabral decided that she wanted to graduate early from high school, without plans to further her education. But Philip Lamm, a math teacher and guidance counselor at Cabral’s high school, argued that she was too good of a student not to pursue higher education. Cabral’s parents were originally hesitant, but Lamm was persistent in his efforts. “He literally hand-wrote my application,” said Cabral, adding that he also assisted her in securing the necessary scholarship money. In 1976, Cabral enrolled at UC Santa Cruz. But upon arriving on campus, Cabral said she experienced feelings of frustration and guilt. Many of her peers with similar abilities and intellect did not have a Mr. Lamm, she said, and therefore were not on campus with her. “Everybody has a dream for a better life, it’s just that [Mr. Lamm] cared enough to go the extra mile,” she said. Upon receiving her bachelor’s degree in Political Science from UC Davis in 1987 after transferring and taking time off, Cabral, now married with four young children, moved to Lexington, Mass. and enrolled at the Kennedy School. Despite the challenges posed by balancing responsibilities to both family and academics, Cabral, who was no stranger to obstacles, remained determined to take full advantage of the experience. “Somehow when you appreciate an opportunity you tend to get everything you can out of it,” said Luben Montoya, a friend of Cabral’s from the Kennedy School, reflecting on the outlook of many of his peers with similar backgrounds as Cabral. Embracing an interest in international trade and finance, Cabral fully dedicated herself to her studies. This ambition did not cease after she left Harvard. In 2004, shortly before Cabral was offered her position as Treasurer, she committed to a part-time J.D. program at George Mason University Law School. Though working full-time as Treasurer, Cabral continued with the program, eventually graduating in 2008. Once again, she found herself in a balancing act, but this time she juggled her career and education. 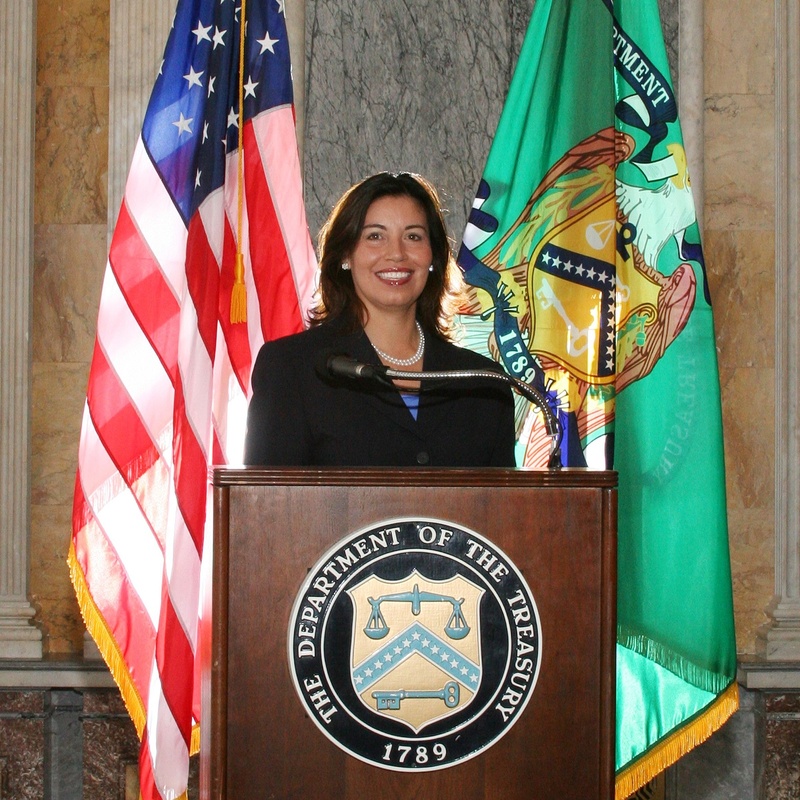 When Cabral was sworn in as Treasurer on January 19, 2005, she became the highest-ranking Latina serving in the Bush Administration. For Cabral, this was an honor, yet she notes that this did not necessarily influence the initiatives that she embraced. “It created avenues that I would be able to follow, but in the end it is my own personal interest and ambition and passion that drive which direction I’m headed,” Cabral said. For David L. Moguel, a friend of Cabral’s from the Kennedy School and a professor of secondary education at California State University Northridge, Cabral’s success as a Latina makes her a role model for his students. Still, Cabral sees her story as one extending beyond the Latino community, a testament to the greater role of a public servant. —Staff writer R. Blake Patterson can be reached at rpaterson@college.harvard.edu. —Staff writer Hellary Y. Zhang can be reached at hellary.zhang@college.harvard.edu.